When we went on our ski trip to New Hampshire, we briefly stopped at my husband's aunt's house on the way. His Aunt Dawn made the most amazing biscotti - it was cranberry almond. It was light, soft(ish), and delicious with a glass of tea. Aunt Dawn sent me her recipe for biscotti. It had a few eggs and lots of butter in it. Although I will try to veganize her original cranberry almond recipe (at some point), I knew that I wanted to make orange ones. I used Dawn's recipe as the base and added some whole wheat pastry flour, flax, and other goodies. While I used whole wheat pastry flour, you could sub in some organic white flour; it will probably make the cookies a bit lighter. Even without the different flour, these cookies aren't quite as hard as regular biscotti - you know I hate crunchy cookies. I took these to book club this week and they passed the test for yumminess. Not only does the biscotti have a delightful orange flavor, but the orange glaze can brighten up anyone's day. It's just what we need to get through these next few weeks of winter. In a small cup, combine the flax and amaretto. Stir and set side for 5-10 minutes. In a large bowl, combine the flour, baking powder, salt, and coconut sugar. Start to add in the other ingredients: coconut oil, flax mixture, zest, and juice. I used my hands to squish this mixture together. 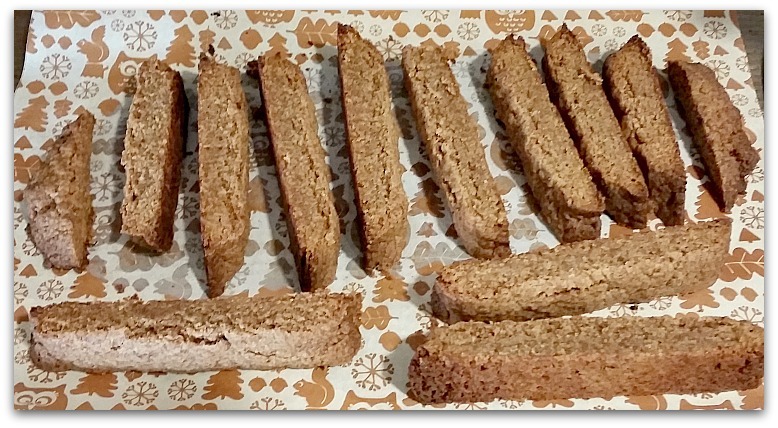 Allow the biscotti to cool for 5 minutes and slice it while it's still warm. Let it cool. When you're ready, mix the glaze ingredients; it should be the consistency of Elmer's Glue. Drizzle it over the cookies. I like to have a bit of glaze in each bite. In my opinion, it makes the cookies 100% better. Enjoy these cookies; I hope they brighten your day!